If you have a caring attitude, the ability to command a child's attention, and are passionate about helping to shape the lives of future generations, an online degree in elementary education can set you on the path toward an extremely rewarding career. An elementary education degree gives you the skills and knowledge to teach students from the first to the sixth grade a variety of subjects, including language arts, math, science, and history. Generally, schools require that you also earn your teaching certification prior to working in a classroom setting, which can be completed alongside your bachelor's degree. Online elementary education degree programs combine online coursework with field experiences, like student teaching in local schools, to prepare students for the real-world rigors of the classroom. Students who graduate with a bachelor's in elementary education can go on to teach at the elementary or middle school level, or with the proper certifications, can work as a special education teacher, administrator, or instructional specialist. Many students interested in obtaining a bachelor's in elementary education already work with children in some capacity, such as a daycare worker or teacher's assistant. That's where online elementary education degree programs come in; they're more flexible than traditional programs, so many students can continue to work as they take classes online. Plus, online classes are typically much more affordable than the traditional college experience. 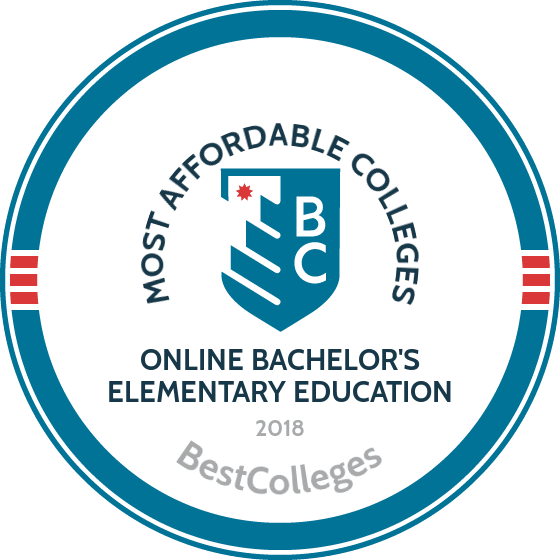 This list highlights some of the best colleges for students looking for an affordable online elementary education degree option -- though, crucially, not a cheap online elementary education degree. At a cheap college, you get what you pay for -- and if you aren't paying much, you're not getting much in terms of a decent education. Our list of the most affordable online elementary degree programs focuses on programs that provide exceptional value. Your dollar stretches further while you still get a world-class education. Western Governors University is a completely online university that awards credit through a competency-based approach. Using this assessment method, distance learners progress through their program by demonstrating mastery of key skills, rather than by earning credits. The school is also generous in accepting transfer credits, and applicants who hold associate degrees usually satisfy all lower-level bachelor’s requirements. WGU’s bachelor’s of arts in interdisciplinary studies is a low-cost program that charges distance learners a flat-rate tuition. Students pursuing this affordable elementary education degree online obtain teacher licensure. Courses are taught asynchronously and cover fundamental subject areas like world history and natural science, as well as professional skills such as education assessment. The 122-competency unit program is ideal for unlicensed or substitute teachers and involves hands-on classroom teaching experiences. WGU is the first completely online university to earn approval from the National Council for Accreditation of Teacher Education. Applicants to this program must also pass a state-specific teaching skills exam. The University of North Carolina in Wilmington has a wide variety of online degrees, ranging from criminology to school administration. The school offers discounted rates to distance learners, and most online classes are taught asynchronously with only occasional synchronous requirements. UNCW’s bachelor’s of arts in elementary education licenses graduates to teach grades K-6 in the state of North Carolina. Distance learners studying elementary education can choose a concentration in a specific subject area, including English as a second language, math and technology, or science and health. Especially motivated candidates can elect to pursue optional certifications in fields such as education for young children or curriculum, instruction, and supervision. While pursuing this elementary education degree online, students also complete three short field experiences in a public school setting before carrying out a final semester-long internship that is focused on a practicum experience. Founded more than a century ago, Fort Hays now serves almost 15,000 students on-campus and online. The school’s virtual college has specialized in distance education for more than two decades and currently has more than 600 online courses each semester. FHSU offers several online bachelor's programs, including degrees in accounting, computer science, marketing, and education. The bachelor’s of science in elementary education prepares distance learners to obtain teaching licensure in Kansas and provides students with teaching and internship experiences in diverse classroom settings. Classes in this 127-credit program are delivered asynchronously and cover topics such as human growth and development, classroom management, and literacy methods. Applicants interested in pursuing this elementary education bachelor's degree online should have either a 2.0 (in-state) or 2.5 (out-of-state) GPA, along with a composite ACT score of at least 21 or a composite SAT score of at least 1080. The Monroe branch of the University of Louisiana currently offers more than 30 online degree programs. Ideal for working professionals, ULM’s programs are accelerated and allow students to take classes in four-, eight-, or 16-week formats. Undergraduate online programs include bachelor’s degrees in modern languages, business administration, and elementary education. ULM’s 120-credit bachelor’s of science in elementary education is a four-year program that combines instruction from five areas: general studies (classes common to all undergraduate programs), professional and pedagogical studies, content studies (classes in mathematics, science, social studies, etc. ), integrative studies, and clinical and field experiences (student teaching). Students pursuing this affordable elementary education degree online pay the same tuition rate, regardless of their state of residence. Transfer students must have either an associate degree or at least 18 college-level credits with a 2.0 GPA, including at least one English and one mathematics course. With campuses in Juneau, Sitka, and Ketchikan, the University of Alaska Southeast emphasizes the cultural importance of the region’s native coastal peoples. The school also has an eLearning branch that offers synchronous and asynchronous online classes at the certificate, undergraduate, and graduate levels. The bachelor’s of arts in elementary education prepares graduates for K-8 teaching licensure in the state of Alaska. Curriculum covers a wide range of subjects but emphasizes the importance of diversity through classes such as Alaskan native cultures and multicultural education. Students gain extensive hands-on professional experience through a nine-month internship during their senior year, in which they complete intensive, mentored field experiences in a classroom setting. Well-qualified applicants should have a GPA of 3.0; those applying with a lower GPA should have an ACT score of at least 18 or an SAT score of at least 955. Located in Graceville, the Baptist College of Florida delivers instruction online and through distance centers in Jacksonville and Orlando. Most classes are taught asynchronously, and all of BCF’s degree programs incorporate courses that focus on the Bible. The 127-credit bachelor’s of arts in elementary education fuses fundamental professional skills, such as the psychology of teaching and learning, with various educational concepts, including the theoretical underpinnings of English as a second language. Courses also focus on literacy and reading instruction. Additionally, BCF emphasizes the practical application of skills, requiring two internship experiences that total more than 20 credit hours. This affordable online elementary education degree does not charge out-of-state students additional tuition or fees. Applicants to BCF must submit a church and pastor recommendation along with a personal recommendation. Drexel is one Philadelphia’s leaders in distance education, offering nearly 150 accelerated online degree and certificate programs that are well-suited for working professionals. The majority of its online courses are taught asynchronously, although some professors occasionally hold synchronous live events. DU’s bachelor’s of science in education allows online students to pursue one of two certification tracks: PreK-4 elementary education or PreK-4 special education. This part-time degree program requires applicants to have at least 24 transferable college credits, although students can transfer up to 60 semester credits into the program. Classes cover a variety of topics, such as early literacy and teaching in urban contexts. The program also includes nearly 200 hours of pre-student teaching followed by 12 weeks of full-day student teaching. The program typically takes 2.5 years to finish. Students enrolled in this elementary education bachelor's degree online program pay tuition that is 40% less than DU’s on-campus rate. Based in Greenville, North Carolina, East Carolina University has been a distance education pioneer for more than half a century. ECU currently offers over 70 online degree and certificate programs. Although most courses are delivered asynchronously, some might include synchronous, real-time chat sessions. All distance learners have access to free tutoring, academic mentoring, and study skills coaching services through ECU’s academic success center. ECU’s bachelor’s of science in elementary education leads to North Carolina teaching licensure. This 128-credit degree includes instruction in the foundations of American education and teaching diverse students, along with the hands-on application of skills through an elementary internship seminar. Distance learners at ECU pursue their bachelor’s in elementary education through a degree-completion program, taking the first two years of their studies at a local community college. The program currently accepts transfer students with a GPA of at least 2.5. Alaska’s premier educational institution since the early 1900s, the University of Alaska at Fairbanks offers a variety of distance degrees at the undergraduate and graduate levels. Most of UAF’s online courses are taught asynchronously, with only a small percentage involving synchronous elements (e.g., video or audio conferencing). The bachelor’s of arts in elementary education is designed for students living in Alaska’s rural areas. The curriculum is concerned with developing culturally-responsive teachers within Alaska’s diverse communities and includes courses such as Alaska native education and communication in cross-cultural classrooms. Additionally, students complete an intensive, year-long internship in an Alaskan school setting to apply the theory they learned in the classroom to a practical setting. This low-cost online elementary education degree offers tuition that is well below the national average. Applicants should have a 3.0 GPA; however, students with a GPA above 2.5 can still apply if their ACT score is at least 18 or their SAT score is at least 955. Hawaii’s only Catholic university, Chaminade serves a diverse student body in the city of Honolulu. The school offers more than 10 online undergraduate programs, including degrees in religious studies, management, and elementary education. Online courses are typically accelerated and follow 10-week schedules. Applicants should have a GPA of at least 2.5 and either an SAT score of 1000 or an ACT score of 19. CUH’s bachelor’s of science in elementary education prepares students for K-6 licensure in Hawaii. Students pursuing this elementary education degree online complete curriculum that covers diverse topics, including the contemporary peoples of Hawaii and intercultural communication. The program includes 15 weeks of student teaching experiences as well as a service-learning focus, which requires distance learners to work with struggling students at local elementary schools, especially those that serve students from immigrant families. According to U.S. News & World Report, Bemidji State University is one of the top universities in the Midwest. The school serves about 5,000 undergraduate students and offers a variety of distance education programs, including hybrid degrees in social work, nursing, and elementary education. BSU’s bachelor’s of science in elementary education is a blended degree that can be completed mostly online; however, it requires three visits each year to the school’s Twin Cities campus. This affordable online elementary education degree program takes just three years to finish and is ideal for transfer students who already have an associate degree. The 63-credit program offers courses in educational psychology alongside in-depth classes in core academic subjects. The program also incorporates clinical experiences, allowing distance learners to engage in student teaching locally or at international destinations. Applicants should have a GPA of at least 3.0. Western New Mexico is a leader in distance education, delivering almost 200 online classes each year in disciplines that include criminal justice, social work, and elementary education. Almost all classes are fully asynchronous, although some courses have occasional synchronous requirements. The school has transfer partnerships with eight local colleges, including Central Arizona College and the University of New Mexico-Gallup. WNMU’s 120-credit bachelor’s of science in elementary education allows distance learners to pursue teaching endorsements in several academic fields, including the arts, mathematics, reading, and health science. Online learners complete a 10- to 12-credit student teaching capstone experience where they work in a local classroom setting in Cobre, Deming, Hatch, Silver City, or Lordsburg. As they progress through the bachelor’s curriculum, students must pass three New Mexico Teacher Assessment or National Evaluation Series exams. This affordable online elementary education degree program provides tuition guarantees for full-time students who maintain a GPA of 2.0. For nearly 200 years, Judson College has provided quality education to women at its Marion, Alabama campus. Today, the school also offers 11 co-ed distance learning majors, including business administration, criminal justice, and education. Online courses are self-paced, giving students up to six months to finish requirements. JC’s bachelor’s of science in elementary education prepares students to teach grades K-6 and emphasizes hands-on participation. The 128-credit program requires a 12-credit hour internship that includes work in a classroom setting, along with separate field experiences. Classes also emphasize cultural diversity, and students are required to take two courses on multicultural perspectives. Additionally, JC encourages students in its online elementary education degree program to complete service learning experiences, such as working with Habitat for Humanity or volunteering as a coach for after-school activities. Applicants to this online program should have a GPA of 2.0 or higher. Baptist missionaries founded Ottawa University in Kansas City over 150 years ago to serve the educational needs of the Ottawa Indian Tribe. Today, the school offers online programs in health, the arts and sciences, business, and education. Coursework is delivered through accelerated, asynchronous classes that take eight weeks to finish. OU also has a generous transfer policy, accepting up to 80 credits from other institutions. Its online bachelor’s of arts in elementary education serves students living in Arizona, Kansas, and Missouri. In this hands-on program, distance learners take a practicum class for each major academic subject, preparing them to teach science, math, and reading. The program prioritizes student teaching experiences, requiring 12 credits in a clinical classroom setting alongside course-specific field experiences. Online coursework at OU is accessible through the Blackboard learning management system. Established in central Kentucky in the mid-1800s, Midway University currently offers several online programs, including degrees in sports management, psychology, and education. Accelerated online classes are taught asynchronously and require just eight weeks to complete. Students can finish most degrees entirely online or as a hybrid program with some evening classes on-campus in Midway or Lexington. Students pursuing this 120-credit bachelor’s of arts in elementary education take classes in special education, human growth and development, and educational technology. The curriculum culminates with a 12-credit hour student teaching experience in a classroom setting. Distance learners pursuing this affordable elementary education degree online pay less than half the on-campus tuition rate, and nearly all students receive some form of financial aid. Applicants must apply directly to the education program and have a GPA of at least 2.75. They must also have passing PRAXIS scores and 20 non-classroom field hours. U.S. News & World Report ranks Saint Mary-of-the-Woods College’s online programs among the best in the country. Online programs at this Indiana-based institution allow students to enroll year-round and take two asynchronous classes every eight weeks. These programs are ideal for transfer students; more than 60% of distance learners at SMWC enroll with at least 15 transfer credits. The bachelor’s of science in education, kindergarten to grade 6 program allows students to pursue a concentration in math, reading, social and behavioral sciences, or social studies. This program progresses toward an Indiana teaching license and requires field and student teaching experiences in a variety of classroom settings, including experiences in elementary education and urban education. Students pursuing this elementary education bachelor's degree online also complete a capstone project that focuses on topics such as social justice, sustainability, and global women leading change. In 1910, the University of Southern Mississippi opened its doors in Hattiesburg as a school for teachers. Today, it continues this tradition with an asynchronous online degree in elementary education. Applicants to USM should have either a 3.2 GPA or a GPA of at least 2.0 with an ACT score of 18 or an SAT score of 860. USM’s bachelor’s of science in elementary education is designed for current teacher’s assistants. Distance learners complete student teaching requirements in their place of employment, making it easy to balance academics with a busy career. Education curriculum follows a block structure that features pre-set class clusters. This allows students to finish their degree requirements in two years while taking courses that cover literacy, data analysis, and the foundations of early childhood. The University of Wisconsin’s Superior branch has trained teachers for over a century. Today, the school serves more than 600 distance learners with online degree programs at the associate, bachelor’s, and master’s degree levels. UWS accepts up to 72 transfer credits from two-year institutions. UWS offers a bachelor’s of arts and a bachelor’s of science in elementary education. While pursuing their degrees, students gain hands-on experience working with children as either a student teacher or a teaching intern. Distance learners are also encouraged to further specialize their education by completing a minor in fields such as English, geography, Spanish, or science. Classes are mostly online, but students have to occasionally travel to campus for three-week blocks during the summer. This low-cost online elementary education degree takes four years to finish. Since it was established as a high school more than 100 years ago, Gardner-Webb has grown into a university that currently serves almost 4,000 students. Through its main campus in Boiling Springs, North Carolina, the school now offers nine online undergraduate programs, including an elementary education degree. Its bachelor’s of science in elementary education is a degree-completion program that covers essential topics in child development alongside a varied curriculum in academic subjects like art, math, and social studies. Bachelor’s students also focus on the evolution of the modern classroom and take classes such as facilitating learning in 21st century schools. Three of the program’s semesters emphasize fieldwork in real elementary classrooms, while the final semester focuses on a 12-credit student teaching experience. Applicants must have a GPA of at least a 2.0 and 44 transfer credits. As a multi-denominational Christian institution, Asbury University emphasizes the importance of spirituality in its curriculum. In addition to its 40 on-campus majors, the school supports four online degree-completion programs for working professionals, including a bachelor’s degree in education. The 124-credit bachelor’s of science in elementary education has an interdisciplinary focus, allowing students to emphasize a variety of specialized academic fields such as literature, math, or science. In addition to these emphases, the curriculum includes synchronous and asynchronous courses in foundational subjects like classroom management and performance assessment. Because students need to complete 12 credits of teaching requirements in a Kentucky classroom setting, this bachelor’s program is best-suited for Kentucky residents or distance learners who can travel to Kentucky for clinical experiences. Students pursuing this inexpensive elementary education bachelor's degree online can transfer up to 75 credits into the program. The largest university in Virginia, Liberty University serves more than 110,000 students each year. The school offers nearly 300 online degree programs, including over 70 virtual degrees for undergraduates. Originally named Liberty Baptist College, LU is committed to infusing its curriculum with the core concepts of Christianity. LU’s bachelor’s of science in elementary education interdisciplinary studies splits its major curriculum into two sections: one that emphasizes educational philosophy and principles and one that focuses on major academic fields like math and science. Online courses are taught asynchronously and cover topics that include constitutional government and free enterprise. Students enrolled in this affordable elementary education degree online program can also choose to complete an optional 90-hour practicum experience. The 120-credit program allows distance learners to transfer up to 90 credits toward their bachelor’s degree. Applicants should have a 2.0 GPA or higher. Mayville State University provides online degrees in a variety of fields, such as physics, nursing, and education. The school delivers fully-online classes and interactive video network (IVN) classes through distance centers in several locations, including Wahpeton, Bottineau, and Fort Totten. Classes are taught both synchronously and asynchronously. The bachelor’s of science in education in elementary education requires distance learners to take some classes at an IVN site in North Dakota. Students must also choose a minor area of study in early childhood, business administration, library media and information science, science for the elementary teacher, or special needs generalist. Additionally, all distance learners pursuing this elementary education bachelor's degree online complete an information technology certificate program to enhance their ability to teach in technologically advanced classrooms. MSU works with community and technical colleges in North Dakota, Minnesota, and Wyoming to make it easy for students with associate degrees from these states to transfer into its programs. From humble its beginnings as Cooper College in the 1800s, Sterling has evolved into one of the best private colleges in the state of Kansas. Graduates of SC’s bachelor’s in elementary education program obtain a Kansas teaching license and take in-depth classes related to teaching methods in elementary math, science, social science, and literature. Distance learners enrolled in this online elementary education degree program also complete clinical teaching experiences near their homes. Additionally, students can pursue minor endorsements in a variety of subjects, including biology, health and physical education, or history. The bachelor’s program is completed mostly online, but it does require students to visit campus up to three times. Traditional applicants should have a 2.2 GPA and an ACT score 18 or an SAT score of 940. Alternatively, transfer students should have a GPA of at least 2.0 and must complete 24 of their final 30 credits at SC. For nearly 40 years, Southwestern Adventist University has offered a range of distance education programs. These online programs include bachelor’s degrees in business, theology, and elementary education. All of the curriculum at SAU incorporates the school’s Seventh-day Adventist (SDA) faith. Applicants to the distance education program should have a GPA of at least 2.0, 24 transfer credits, and demonstrable work experience. The 125- to 130-credit bachelor’s of science in elementary education has two tracks: one that leads only to state licensure and one that includes both state licensure and SDA certification. The program prepares students with “microteaching” experiences, involving classroom observation, and a 14-week school internship. Distance learners also participate in community service activities, where they can work with at-risk students, and extracurriculars. Students must complete field experiences, internships, and service activities locally in Johnson County schools. Distance learners pursuing an elementary education bachelor's degree online enjoy affordable tuition rates that are significantly lower than on-campus rates. Nestled in Southern Appalachia, Lees McRae College offers online programs in nursing, human services, criminal justice, and education; these programs are designed for transfer students with at least 60 collegiate credits. The bachelor’s of science in elementary education is a 60-credit degree program that leads to North Carolina teacher licensure. Students undertake field experiences and a full-time student teaching internship in the Banner Elk region. Additionally, distance learners complete a final project that documents the implementation of a major academic project and its impact on the classroom. Graduates of this program are prepared to teach in private schools, teach abroad, and work in administrative roles in the field of education. Applicants who want to pursue this affordable elementary education degree online must have a combined PRAXIS score of 468 and an associate degree in elementary education with a 2.7 GPA.